The most common Rope Cutter installed to Hallberg-Rassy yachts. Require a minimum of shaft space. Manufactured in stainless steel 316L. In front of the rope cutter, between the rope cutter and cutlass bearing, should be a minimum distance of 50% of the shaft diameter. 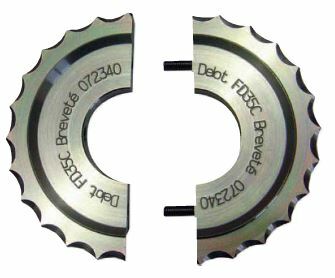 For a 30 mm shaft, you would require 30mm/2 = 15 mm between front surface of the rope cutter and the aft edge of the cutlass bearing. This space is to allow for the propeller and engine motions. The 30 mm rope cutter also require 18 mm distance on the shaft. Total required space on the shaft 15 mm + 18 mm = 33 mm. If you have a shaft with a P-Bracket construction, the situation is a little different and other requirements could rule.